Depending upon your preference and budget Bay Heliwork have developed a choice of helicopter package tours, starting at just $200 per person*. If none of these suit your requirements we can develop a helicopter charter package to suit your particular requirements. Costs for you own charter are based on an hourly rate - $1,600/hour, 1-3 people. 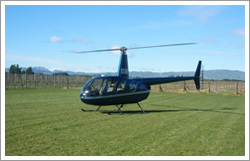 From the heart of the orchard area take in the expanse of the Hawke’s Bay vineyards before the vista of the coastal area from Mahia Peninsula to Cape Kidnappers opens before your very eyes. Take a look at the world-class golf course perched on the cliff edge with emerald like greens and then be astounded by one of the largest gannet colonies in the world. 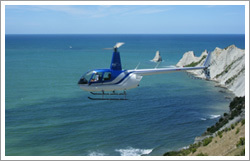 Flying south you will experience the golden surf coastline around Bear Island and Waimarama before heading back to the majestic Te Mata Peak and onto the base over Havelock North and Hastings.